The public holidays in Dubai can be broadly classified into two categories, ones that are fixed in the standard Gregorian calendar and Islamic holidays based on Hijri Calendar. Hijri calendar is an Islamic lunar calendar, whose count begins in 662 AD with 354 days and Islamic holiday dates are based on moon sightings. The start date of each month in the Hijri calendar is also determined by local sightings of the moon. Sometimes a public holiday in Dubai can be moved to the beginning or end of a week, if it falls between two working days. This is one reason Dubai public holiday dates in 2019 may differ slightly to the below list as we get closer to each occasion. In fact the actual dates of Islamic holidays are only confirmed a day or two before they begin like Ramadan and both Eids. The UAE government announces the list of Public holidays at the beginning of every year. These holidays are paid ones and public sector employees can expect more holidays than those working in the private sector. 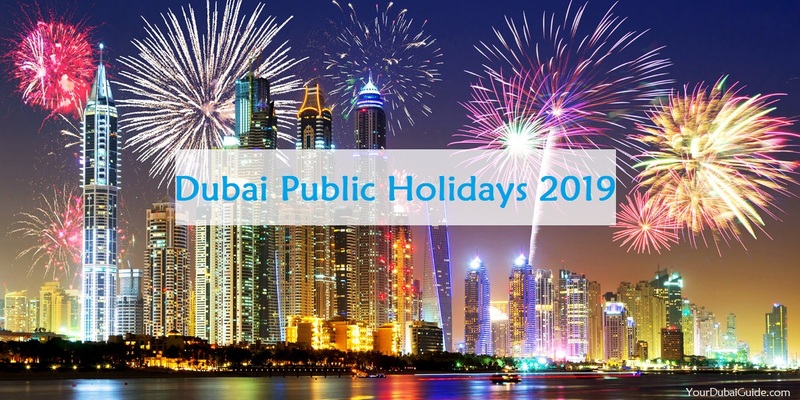 So get your calendars ready – as here we take a look at Dubai Public Holidays 2019. All Islamic holidays are subject to moon sighting and the dates will be announced once the crescent moon is sighted, a few days prior to the holiday. Public sector holidays are usually more than the holidays for private sector. Exact dates of Public and Private holidays are announced by the government before most holidays. New Year’s Day, which is on January 1, marks the start of the year in the Gregorian calendar and it’s a public holiday in most of the countries with the exception of Israel. The UAE joins the global party with fireworks, parades, and parties. Every year, the Burj Khalifa is the centrepiece for one of the greatest firework displays in the world. Known as the The Prophet’s Ascension, Ascension to Heaven or the Night Journey, Isra and Mi’raj is a holiday observed on the 27th day of Rajab, the seventh month in the Islamic calendar. On the night of Israa Wal Miraj, it is beleived that Prophet Mohammed travelled from Makkah to Jerusalem, where he met with all the prophets who preceded him; He then travelled to the heavens, and received divine instructions on acts of worship such as five prayers a day. Isra means “night journey,” and miraj means “ascension.” To celebrate The Prophet’s Ascension, both public and private sector workers get a paid day off by government decree. Celebration of Isra and Mi’raj include prayers during the night and many Muslim cities will keep their lights on all night. Ramadan is one of the five pillars of the Islamic faith and is sacred to Muslims. The Holy Month of Ramadan is the month of prayer and fasting. It is the ninth month in the Hijri calendar and commemorates the time when the Qu’ran (Islamic holy book) is said to have been revealed to Prophet Muhammad. During Ramadan, Tarawih prayers take place in the evening across UAE mosques and Qiyam, or midnight prayers are offered in the last 10 days. Though there is no public holiday, working hours are shortened for the public and private sector for the holy month. Eid Al Fitr marks the end of Ramadan, the Islamic Holy Month of fasting. It is also the first day of the Islamic month Shawwal. There is an official government-appointed, moon-sighting committee that declares Eid Al Fitr upon the sighting of the crescent moon. Both government and private employees typically receive two paid off-work days. Many Emirati Muslims go to mosques on Eid Al Fitr to hear a sermon called a khutba, and to give away food as an act of charity called zakat-al-fitr. Arafat Day is the second day of the week-long Hajj pilgrimage that many Muslims from UAE and elsewhere go on every year. On Arafat Day, hundreds of thousands gather on the hill called Mount Arafat, praying, and reading the Koran. It is believed, Muhammad gave his “farewell address” from this hill. In Dubai, Arafat Day is a public holiday but travelling will be hectic as thousands make their ways to and from Mecca. Those who can’t go on pilgrimage instead attend mosque, fast, and offer extra prayers at home. Eid al-Adha commemorates the Quranic account of Ibrahim offering up his only son, Ishmael on Mount Moriah in obedience to Allah’s command. A government moon-sighting committee officially declares the exact date for Eid al-Adha. Animal sacrifice (called qurbani) constitute a major part of this festival.In the UAE, for health reasons, sacrificing animals can only be done in the four official slaughter houses. One third of the meat from the sacrificed animal is kept by the family, a third is given to friends and relatives, and a third is donated to the poor. Eid al-Adha has a distinctly religiousness to it, with morning prayers at the mosque, listening to a sermon on the importance of sacrifice, wearing new clothes, and animal sacrifice (called qurbani) constituting a major part of how it is observed. It falls on the first day of the month Muharram, the first month of the Islamic lunar calendar. It is also known as “Al Hijra” (“flight”) because it commemorates the flight of Muhammad from Mecca to Medina on this day. Since it is based on moon sightings, the exact date is declared by the official moon-sighting committee. All celebrations begin around 6pm, for the Islamic day always starts after sunset. Also known as Commemoration Day, Martyr’s Day is observed every year on 30 November in remembrance for those who have sacrificed their lives during the Battle of Greater Tunb, when Iran attempted to seize offshore Emirati islands, in the First Gulf War and during the Saudi-led alliance against Iranian intervention in Yemen. The Sunni date of Muhammad’s birthday is a public holiday and a paid holiday in the UAE. This day celebrates the day on which Prophet Mohammad was born and is celebrated on the 12th day of Rabi Al Awwal. According to UAE tradition Islamic poetry is recited from the Al Mawlid Al Barzanji . There are live shows on television, on stage, and from the Bahar Palace in Abu Dhabi. This celebrates the day that the seven emirates – Abu Dhabi, Dubai, Ajman, Sharjah, Fujairah, Umm al Quwain and Ras al Khaimah came together to form UAE . Although the UAE was a British Protectorate, the protectorate treaty was withdrawn on December 1 1971, paving the way for the federal unification of the Trucial States under late Sheikh Zayed bin Sultan Al Nahyan, the federation’s first president. When is Commemoration day in Dubai in 2019? Commemoration day is named as Martyr’s day in 2017.